Guru Maneyo Granth (English: Consider the Granth to be the Guru), refers to the historic statement of the 10th Sikh Guru, Guru Gobind Singh (1666–1708), shortly before his death affirming the sacred text Adi Granth as his successor, thus terminating the line of human Gurus. Installed as the Guru Granth Sahib JI, it is now the central text of Sikhism, and the eternal Guru of all Sikhs. It is central to Sikh worship as it is said to imbibe a living spirit of Ten Sikh Gurus. 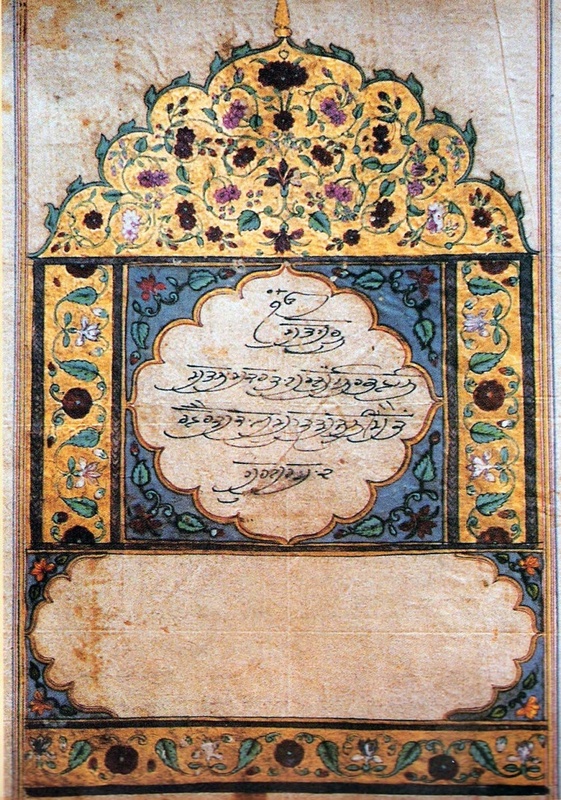 Guru Gobind Singh Ji had written this Dohra at Hazoor Sahib. He wrote this Dohra after giving Gur Gaddi to Guru Granth Sahib Ji and original text is at Hazoor Sahib and this is being read there since 10th Guru’s time. This Dohra is also written in Giani Gian Singh’s book and perhaps also in Biaji Mkut Sakhi 10. The Dohra is also quoted in a few Rehitnamas. A Rehitnama is a Hukam or Order, of the Guru which has been scribed by the Sikhs who were close to the Gurus at the time. Just as a Judge announces a judgement but the the Recorder or Secretary records the judgement on paper, similarly Rehitnamas are the judgements and instructions of Guru Sahib which have been scribed and recorded by the Gursikh companions of Guru sahib at the time. The composition of this sacred Granth contains rendering (Bani) of six Gurus of Sikh faith and some Bhaktas and saints. It was composed in this form in the year 1604 with the addition later of Guru Tegh Bahadur Sahib Ji’s Bani (sacred composition). And its blessings are sought by the seeker with devout heart. Sikh religion sincerely believes that in each of succeeding Gurus, the spirit of Guru Nanak Dev ji was operating incarnated. The sacred Granth is installed in all Sikh holy places of worship and treated as presiding presence of Guru, an apostle of Divine Truth. The devotees of congregation in solemn assembly pray and seek blessings of the Supreme. This comes through in the mystical thought of Gurbani and it stands for realization of the Truth. The Gurus’ word, known as ‘sabad’ is taken as the mystic thought of Guru. In the words of Bhai Gurdas, a great scholar of Guru’s time, “In the word is the Guru, and the Guru is in the word (sabad). In other words, the human body was not the Guru but the light of the word (shabad) and within the heart was their real personality.” When the human mind dives deeper and deeper into the Guru’s word, all mental impurities depart and wisdom of the Guru draws on the human soul. Thereby the devotee attains the divine light and wisdom which makes him to contemplate on God’s name (naam). In the light of above realities, the Sikh religion makes the holy Granth as a living master of Sikh Panth.